CANTARRANA, Cuba (AP) — It's like a vision of the space age, carved out of the jungle: Thousands of glassy panels surrounded by a lush canopy of green stretch as far as the eye can see, reflecting the few clouds that dot the sky on a scorching Caribbean morning. Cuba's first solar farm opened this spring with little fanfare and no prior announcement. It boasts 14,000 photovoltaic panels which in a stroke more than doubled the country's capacity to harvest energy from the sun. The project, one of seven such farms in the works, shows a possible road map to greater energy independence in cash-poor Cuba, where Communist leaders are being forced to consider renewables to help keep the lights on after four failed attempts to strike it rich with deep-water oil drilling and the death of petro-benefactor Hugo Chavez. "For us this is the future," said Ovel Concepcion, a director with Hidroenergia, the state-run company tasked with building the solar park 190 miles (300 kilometers) east of Havana in the central province of Cienfuegos. "This is just like having an oil well," he told The Associated Press on a recent tour of the facility. Outside experts have chastised Cuba for missing an opportunity to develop alternative energy sources; just 4 percent of its electricity comes from renewables. That lags behind not only standard-setter Germany (25 percent) but also comparable, developing Caribbean nations such as the Dominican Republic (14 percent). US wind growth has ground to a halt this year, with no new installations completed in the second quarter of 2013, figures from the American Wind Energy Association show. The new figures are even worse than Q1's 1.6MW of new installations, effectively just one GE 1.6MW turbine. The next slackest period for wind power in the States was the first quarter of 2010, with 541MW of completed installations. The figure for the final quarter of 2012 was 8,380MW. In its report, the AWEA accepted that the wind power industry ‘slowed dramatically’ in the first half of 2013, and it cited the late extension of the production tax credit (PTC) and ‘historic levels’ of installation at the end of 2012 as reasons. But it insisted that activity was ‘picking up’ in the industry, listing as evidence more than 3,950MW of long-term power purchase agreements signed, and more than 1,300MW of self-builds announced, by utilities since January. There was 1,280MW of wind power under construction across eight US states as of June 30. With an incentive programme now in place, the German PV industry looks to promote self-consumption, but what do installers and adopters need to know? Unlike a traditional, large thermal power plant, where hundreds of megawatts or even gigawatts are generated in a single geographic location, our solar facilities will be distributed all across the country and eventually, around the world. Thermoelectrics is a means of utilising thermal energy by converting it to electrical energy so that, when there is a heat differential between the opposing sides of certain semiconductor materials, the difference in temperatures causes the electrons in the material to move, creating an electric current. By reducing energy consumption through the use of geothermal and solar water heaters while generating energy from renewable sources, the 63D RSC is positioning itself to meet the three percent annually energy reduction goal while creating renewable energy generation projects for the Army Reserve. The Energy Joule takes pricing and consumption data from the home's smart meter and simplifies it into an easy-to-read format, enabling the homeowner to understand their energy usage at a glance. Coronal and Panasonic deliver an efficient and integrated construction and permanent financing solution - mitigating investment risk and offering customers a way to navigate the complexities involved in a solar project by minimizing the effort required to realize the often considerable economic benefits. 2013 is expected to be another record year for new wind energy development in Canada with the largest portion of new projects being developed in Quebec and Ontario. Working together we are offering residential homeowners looking to adopt solar technology greater access to a warranty management program and address concerns about its long-term performance. Solar pumps have high initial costs but almost zero operational, maintenance costs and environmental costs. Now which one is cheaper in its life time operation of 20 years? Residents of a small town in Baja California live off-grid using solar power, and enjoy a lifestyle that continues to attract new homeowners. Experience Single Brand Simplicity with SystemEdge from OutBack Power. 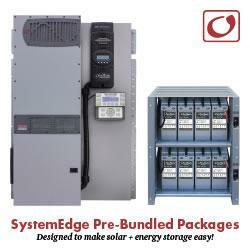 Each pre-bundled package is designed to make solar plus energy storage easy. By combining OutBack's most popular FLEXpower pre-wired systems with matched OutBack energy storage, SystemEdge takes the guesswork out of installing solar plus storage. Every SystemEdge package includes a FLEXpower factory pre-wired system, application-specific EnergyCell batteries and racking, FLEXware ICS Plus combiner and all the necessary connection hardware.